I don't know when it happened exactly. Well, maybe I do. In 2005, an amazing adaptation of Pride and Prejudice was released. Who knows how many times I went to see it in theaters. I bought it the day it came out on DVD, and watched it every night as I fell asleep. Hello Darcy. I read the book, expecting to join the masses of women in the Austen craze. Didn't fancy it much. I'll just watch the movie, I said. Then this past August, I started taking piano lessons (again), and by September I bought the songbook from the Pride and Prejudice soundtrack by Dario Marianelli, and am learning my third song from it. It's challenging, but I'm in love with it. Then I watched Colin Firth as Darcy in the 90's BBC version of Pride and Prejudice, and finally understood the scene in Lost in Austen where Darcy takes a dip in the pond. The whole thing seemed to drag a bit until the last segment, but it was good. Then I watched Persuasion because a good friend of mine made me. I'm tempted to think she watches it almost daily. It was frustrating through most of it, but I enjoyed it by the end. Not sure if I'm interested in tackling the book, which as I understand, was published by Jane Austen's brother after she died. She probably didn't intend for it to get out (along with Northanger Abby). Last Sunday, Masterpiece played its 2007 version of Northanger Abby, which I'm still a bit miffed about. The ending was so abrupt... I find it hard to say if I liked it or not. So far, I am following it surprisingly well. I don't read literary type fiction, ever, mostly because I can't understand it. It's too... beyond my abilities. I don't usually like to think too hard when I read. Just give me mainstream fiction please, or young adult paranormals!! But I find Emma much easier to digest than Pride and Prejudice. My next Austen plan is to tackle Sense and Sensibility. Tune in to Masterpiece on PBS, Sunday nights! I think this Sunday is Persuasion! What about you? Are you addicted to Austen? Are you out of that phase? Are you avoiding the craze? Any Darcy lovers? Mr. Knightley? Mr. Tilney? 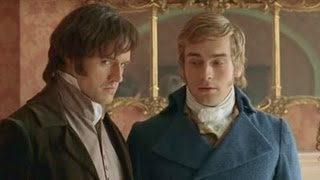 I watched "Lost in Austen" a couple of months ago, and I really liked it. Wasn't too sure in the beginning, but then it just became better and better. They must have had great fun in finding actors that actually look like the BBC version's actors (I've watched that version 3 times or so). The 2005 movie never got to me in the same way, but I guess that is because I already read the book, and, even more, I had watched the BBC series. But, by all means, it's a good movie, and I love Donald Sutherland in the role as Mr Bennet. Talking about roles,- in "Lost in Austen" Alex Kingston is Mrs Bennet, and I have never seen her as anything else than Elisabeth Corday in E.R. ! She is hilarious as the hysterical Mrs Bennet. Good for you for taking piano lessons. A girlfriend gave us a piano about five months ago, and I still don't know how to play. Oh, how I love Mr. Darcy! (wistful sigh) The Keira Knightley, Matthew Macfayden version of Pride and Prejudice is my favorite. When Darcy stutters as he's telling Elizabeth he loves her? Awesome! At the end, as he's calling Elizabeth Mrs. Darcy over and over? More awesome! Being an Austen fanatic, I also saw Lost in Austen and read Austenland. I'm glad you have the fever, too. Isn't it great that there are things this good in the world? lost in austen sounds great. I wonder if i can get it on my netflix. I'm with you. I love the movies and have read a few of the books. Emma was great on pbs. I didn't see Northanger, but maybe I'll read the book first on that one. And I love Mr. Darcy (the 2005 version). 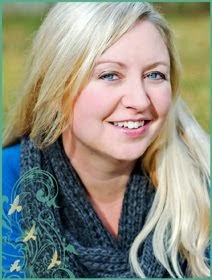 Kristine - I hadn't seen her in anything other than ER either! She was hilarious as Mrs. Bennet! Lisa - we also were given a piano (a 1924 Steinway baby grand! had to move some things around to find a place for it - it sounds amazing), so I signed up for my 5th piano teacher in my life. I think it will stick this time! Thanks for the award!! Sherry - just give it a try! As long as you're not a purist, you just might love it. Falen - Yes, Netflix does have Lost in Austen. That's where I first rented it. :) Give it a shot and let me know what you think about it! Patti - another fever victim! I love the books. 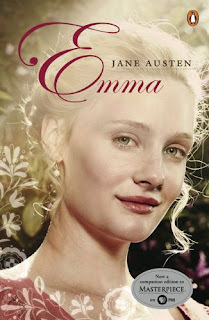 I love the movies and I am so sad that I missed the PBS version of Emma. Lost in Austen sounds so interesting! I'll have to see if I can find it somewhere. Thanks for the tip. I can't wait! I took the Austen heroine quiz. I'm Elizabeth Bennett. Didn't even have to take the quiz. I already knew it. I read Pride and Prejudice at least once a year. I'm an Austen Fanatic. I love the movies too, but haven't seen any of the miniseries that have been on PBS. Apparently, I'm falling behind. Better get a move on! That Darcy is HOT!!! oh my gosh. Wow. It's interesting how Jane Austen pops up in February--like Austen season. Yes, she's great, I have devoured all of her books and seen nearly all the films and BBC specials. I must admit my favourite is Mansfield Park--who couldn't love a heroine named Fanny? But, yes, Pride and Prejudice has got to be the best, if for no one but Mr. Darcy. If you liked the actress from the new Emma, she plays a wonderful part in the film, I Capture the Castle. It's another period film, but from the 30s time period. very good. not Austen, though. I could watch Kiera Knightly all day long. She's gorgeous! I've not seen Pride and Prejudice or read the book -- but I will and am looking forward to it. I love hearing you talk about it, though. You're passion is awesome!!! I love the movies so much that I should give the books a chance!! I love how much you are into it!!! It's fantastic! Can't wait to hear back for more! As an English major, it is sad and embarrassing for me to admit I have never read Jane Austen. sh. don't tell ANYONE. I am quite disappointed I was sick yesterday and missed this post!!!! You know what a Lost in Austen fan I am! Thanks for the pictures too...I'm tempted to keep this exact post as a favorite on my toolbar so I can come back to it at any moment and stare. But, really, what I want to know is...why no photos of Wickham??? Seriously! What are you thinking? I would seriously consider boycotting this post but since you listed the pond scene I guess I'll settle for that. And suddenly I want to go home and rewatch Lost in Austen!!! !